Yurgel, S. N., Lynch, J., Rice, J., Adhikari, N. and Roje, S. (2014). Quantification of Flavin Production by Bacteria. Bio-protocol 4(15): e1197. DOI: 10.21769/BioProtoc.1197. This protocol provides a simple and fast method of quantification for intracellular flavin content, and for flavin secretion by bacteria. Intracellular flavins are extracted from bacterial pellets, and secreted flavins are examined in the cell growth medium. Flavins are separated and measured using HPLC with fluorescence detection, and quantified based on a comparison to standards. Note: The protocol can be also applied to other bacteria. Note: FMN and FAD were further purified as described previously (Sandov et al., 2008). Note: Except as otherwise noted, all other chemicals were obtained from Sigma-Aldrich. Grow S. meliloti on YMB plate for 48 h at 30 °C. The optimal temperature for S. meliloti growth is between 28 °C and 30 °C. Inoculate S. meliloti from the stock YMB plate to an OD600 of ~0.1 in 3 ml MMNH4 medium. Grow cells for 48 h at 30 °C, 250 rpm in 14 ml Falcon or glass tubes completely wrapped with foil to prevent light-induced flavin degradation. In case of testing flavin levels in light-grown culture or flavin degradation by light, the foil could be omitted. Dilute the cells 20-fold into 3 ml fresh MMNH4 medium and grow for 1 or 3 days at 30 °C, 250 rpm in 14 ml Falcon or glass tubes covered with aluminum foil. The length of cell growth could vary from several hours to 10+ days depending on the specific question of the research. For protein assay, break the cells by sonication (Fisher Sonic Dismembrator 300 with the intermediate size attachment and a power setting of 60 %, three times for 3 min each at 4 °C). Remove cells debris by centrifugation (≥ 3,000 x g; room temperature; 20 min). Measure protein concentration in the cultures by using Bio-Rad Protein Assay Kit. Note: Carry out the rest of the procedure for flavin extraction and analysis under as limited lighting as possible since flavins are extremely light sensitive. Protect extracted and filtered flavins from light by storing in a light-tight container. For long-term storage, samples can be stored below 0 °C in a light-tight container. Harvest cells from 1 ml culture by centrifugation (≥ 10,000 x g; room temperature; 20 min) in pre-weighed Eppendorf tubes. Transfer the supernatant to clean Eppendorf tubes. It will be used in step C and can be stored at -20 °C in foil wrapped Eppendorf tubes for later analysis. Wash the pellets with 1 ml MMNH4 buffer and centrifuge (≥ 10,000 x g; room temperature; 20 min). Pipet out all liquid and re-weigh the tube to measure the pellet mass. The pellet mass is expected to be at the range between 5 mg and 10 mg depending on the time of growth. The pellet will be used in step D can be stored at -20 °C in foil wrapped Eppendorf tubes for later analysis. Filter the supernatant left after harvesting the bacteria (step B) using Microsolv 0.22 µm syringe filters. For riboflavin, FMN, and FAD detection, separate the samples by reverse-phase chromatography using a Waters Alliance 2695 HPLC system with a Waters SunFire C18 column (4.6 x 150 mm, 3.5 µm) maintained at 35 °C linked to a Waters 2475 fluorescence detector. Detect riboflavin, FMN, and FAD by using an excitation wavelength of 470 nm and an emission wavelength of 530 nm. Run mobile phase at a flow rate of 1 ml/min for 12 min per sample. Maintain the samples at 10 °C. For lumichrome detection, use excitation and emission wavelengths of 260 nm and 470 nm respectively. Use the mobile phase gradient program indicated in Table 1. The column and flow rate are the same as indicated above. Run mobile phase for 15 min. Column temperature 35 °C. Determine the flavin concentration by comparison to standards (0.05, 0.1, 0.5, 1.0 and 5.0 µM FAD, FMN and riboflavin). Normalize the flavin concentration against the protein concentration (as calculated above in step A8). Resuspend the cell pellets from step B in extraction buffer (1: 10 w/v), heat at 80 °C for 10 min, then centrifuge at 20,000 x g for 20 min at 4 °C. Filter the supernatants using a 0.22 µm syringe filter. Measure riboflavin, FMN, FAD, and lumichrome as described for the secreted flavins. Figure 1. Flavin secretion and accumulation by the S. meliloti strains. S. meliloti strains were grown in MMNH4 media. 1 ml of cell cultures was taken after 3 days of growth. The cells were spun down and the mass of the pellets was measured. 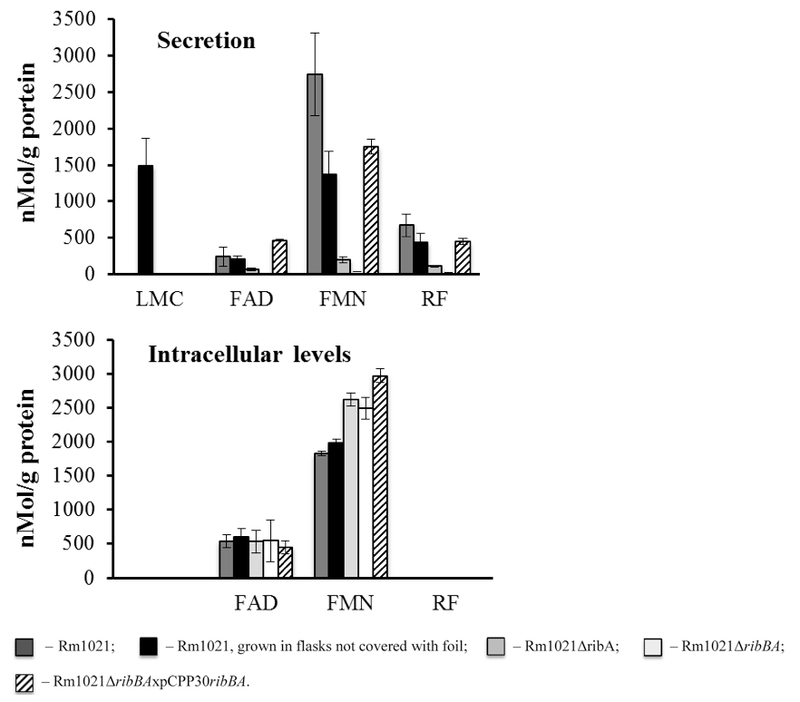 Lumichrome (LMC), FMN, FAD and riboflavin (RF) concentration in the supernatants and the pellets were measured using HPLC. The flavin concentration was normalized against the protein concentration. Rm1021 - wild type strain; Rm1021ΔribA and Rm1021ΔribBA - Rm1021 mutants with decreased ability to secret flavins; Rm1021ΔribBAxpCPP30ribBA - Rm1021 mutant with restored ability to secret flavins. Data are averaged from at least three independent experiments. For 1 liter of extraction buffer/ mobile phase, add the following components in the order below. Mix well after adding all the components. This protocol was adapted from Yurgel et al., 2014. This work was supported by the Agricultural Research Center (WNP-00773) at Washington State University and grant DE-FG0396ER20225 Vol. 27, No. 5, 2014 / 445 from the Energy Biosciences Program at the United States Department of Energy, and by grant NSF-MCB 1052492 to S. Rajamani. This activity was funded, in part, with an Emerging Research Issues Internal Competitive grant from the Agricultural Research Center at Washington State University, College of Agricultural, Human, and Natural Resource Sciences and Biologically-Intensive Agriculture and Organic Farming (BIOAg) Internal Competitive grant from The Center for Sustaining Agriculture and Natural Resources (CSANR) at Washington State University to S. Yurgel. We thank M. Kahn for discussions and the Washington State University Laboratory for Biotechnology and Bioanalysis for sequencing support. Galibert, F., Finan, T. M., Long, S. R., Puhler, A., Abola, P., Ampe, F., Barloy-Hubler, F., Barnett, M. J., Becker, A., Boistard, P., Bothe, G., Boutry, M., Bowser, L., Buhrmester, J., Cadieu, E., Capela, D., Chain, P., Cowie, A., Davis, R. W., Dreano, S., Federspiel, N. A., Fisher, R. F., Gloux, S., Godrie, T., Goffeau, A., Golding, B., Gouzy, J., Gurjal, M., Hernandez-Lucas, I., Hong, A., Huizar, L., Hyman, R. W., Jones, T., Kahn, D., Kahn, M. L., Kalman, S., Keating, D. H., Kiss, E., Komp, C., Lelaure, V., Masuy, D., Palm, C., Peck, M. C., Pohl, T. M., Portetelle, D., Purnelle, B., Ramsperger, U., Surzycki, R., Thebault, P., Vandenbol, M., Vorholter, F. J., Weidner, S., Wells, D. H., Wong, K., Yeh, K. C. and Batut, J. (2001). The composite genome of the legume symbiont Sinorhizobium meliloti. Science 293(5530): 668-672. Sandoval, F. J., Zhang, Y. and Roje, S. (2008). 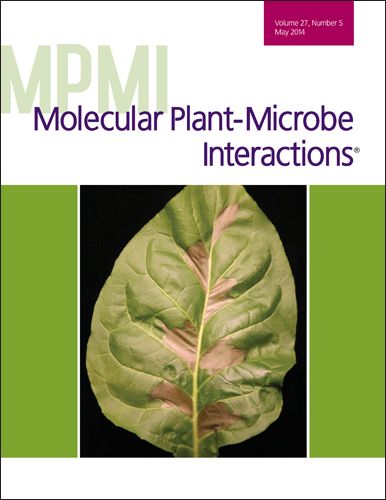 Flavin nucleotide metabolism in plants: monofunctional enzymes synthesize fad in plastids. J Biol Chem 283(45): 30890-30900. Somerville, J. E. and Kahn, M. L. (1983). Cloning of the glutamine synthetase I gene from Rhizobium meliloti. J Bacteriol 156(1): 168-176. Yurgel, S. N., Rice, J., Domreis, E., Lynch, J., Sa, N., Qamar, Z., Rajamani, S., Gao, M., Roje, S. and Bauer, W. D. (2014). Sinorhizobium meliloti flavin secretion and bacteria-host interaction: role of the bifunctional RibBA protein. Mol Plant Microbe Interact 27(5): 437-445. How to cite: Yurgel, S. N., Lynch, J., Rice, J., Adhikari, N. and Roje, S. (2014). Quantification of Flavin Production by Bacteria. Bio-protocol 4(15): e1197. DOI: 10.21769/BioProtoc.1197.